Monday, May 13, 2019, 7 – 8:30 p.m. Sponsored by the UW Japan Studies Program through the Griffith and Patricia Way Lecture Endowment. 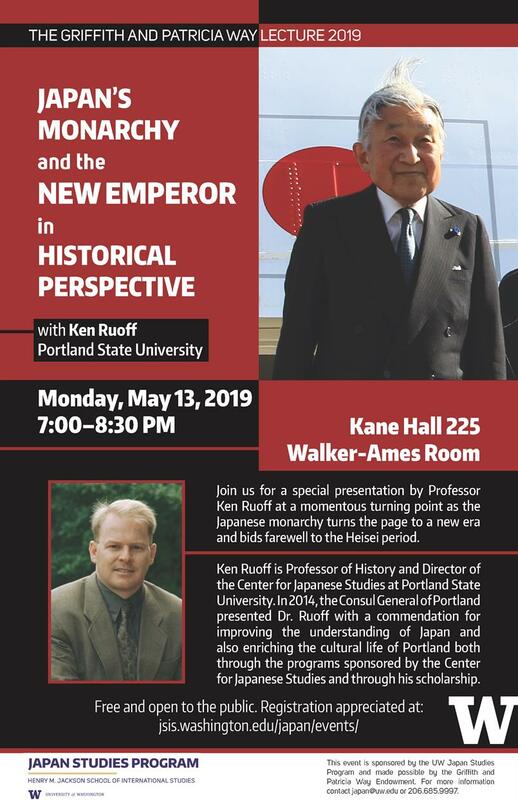 Join us for a special presentation by professor Ken Ruoff at a momentous turning point as the Japanese monarchy turns the page to a new era and bids farewell to the Heisei period. The constitutional position of Japan’s monarchy was fundamentally redefined after the war, and initially conservatives rejected that the emperor was to be “no more than a symbol.” But by the 1970s, the political right had adopted a new interpretation of the throne, namely that throughout most of Japan’s long history, the “true essence” of the throne had been that of a symbol outside politics. Although individual emperors (and emperesses) now operate under strict constitutional limits, it is nonetheless true that each emperor (and empress) puts his stamp on the throne. This was clearly the case with Emperor Akihito, and we can expect it to the case with the next emperor, Naruhito. This talk will explain the structure of the postwar monarchy, and then analyze how Emperor Akihito employed his symbolic position to influence Japanese society, and also offer some thoughts on what we might expect from the next emperor. Ken Ruoff is Professor of History and Director of the Center for Japanese Studies at Portland State University. In 2004, he was awarded the Osaragi Jiro Prize for Commentary, Japan's equivalent of the Pulitzer Prize, for the Japanese translation of his book The People's Emperor: Democracy and the Japanese Monarchy, 1945-1995 (Harvard East Asia Monographs, 2001). His book, Imperial Japan at its Zenith: The Wartime Celebration of the Empire's 2600th Anniversary (Cornell University Press, 2010) was awarded the 2012 Frances Fuller Victor Award for Nonfiction. This book was also published in Japanese translation in December 2010 in the Asahi sensho series under the title 『紀元二千六百年　消費と観光のナショナリズム』. In 2014, the Consul General of Portland presented Dr. Ruoff with a commendation for improving the understanding of Japan and also enriching the cultural life of Portland both through the programs sponsored by the Center for Japanese Studies and through his scholarship. Professor Ruoff was also featured in a 15-minute interview on NHK World regarding the transition to a new imperial era which can be viewed here.